"We see that the U.S. has some difficulties while withdrawing [from Syria],” Mevlüt Çavuşoğlu told parliament’s Foreign Affairs Committee. He also underlined that some of the U.S institutions are divided in opinions on the U.S.’s pullout from Syria. Turkey's stance that the country fully backs Syria's territorial integrity and stability. He said that Turkey has repeatedly rejected U.S. claims that Washington will not withdraw its troops from northeastern Syria without a guarantee from Ankara that it won’t attack “Kurds." Turkey's leadership has stressed that equating "Kurds" with the terrorist PKK/PYD is illicit. Under the Astana process, Turkey has been coordinating with Russia and Iran on Syria, Çavuşoğlu added. 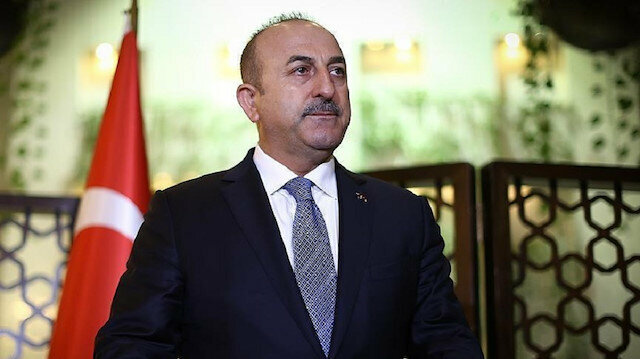 On the northwestern Syrian city of Idlib, Çavuşoğlu said there have been "no problems faced so far with implementation of the Idlib deal, and Turkey has no wish to face problems going forward." Turning to the civil war and humanitarian crisis in Yemen, he said finding a solution to the Yemen issue will be one of Turkey's priorities in 2019. On the Cyprus issue, he said European Parliament elections set for this May have forestalled the start of any Cyprus negotiations. The PKK is listed as a terrorist organization by Turkey, the European Union and the United States. The YPG and PYD are its Syrian extensions. The Syrian regime dropped thousands of internationally-banned barrel bombs in 2018, causing numerous civilian casualties in opposition-held parts of the country, a U.K.-based rights watchdog said Tuesday.According to the Syrian Network for Human Rights (SNHR), as many as 185 civilians -- including 51 children and 55 women -- were killed by barrel bombs last year alone.Frequently used in civilian communities, barrel bombs -- which can raze areas of between 50 and 200 square meters -- have been used by the regime roughly 26,000 times since September 2015, the SNHR claims. The YPG/PKK terrorist group is forcing Syrian civilians to leave refugee camps set up east of the Euphrates River, local sources say.According to information compiled by Anadolu Agency correspondents in the area, the YPG/PKK is terrorizing people staying at refugee camps in rural areas in Syria’s Deir ez-Zor province.YPG/PKK terrorists accuse refugees of being members of the Daesh terrorist group, threatening them with death if they do not relocate to the Al-Hawl district near the Syrian-Iraqi border.The incidents are occurring in residential areas, such as Ayn al-Arab, Tal Abyad, al-Tabqah and Qamishli, where more than 70 percent of the population is Arab.Since Daesh lost its influence in eastern Syria, the YPG/PKK has prevented displaced Syrians from returning to their homes, drawing accusations that the group is trying to change the region’s demographic composition.A recent report by the Federation of Syrian Tribes and Clans stated that some 1.7 million people in the region had been displaced by YPG/PKK terrorists. The U.S. does not talk about the timelines of their withdrawal from Syria, Secretary of State Mike Pompeo said on Monday. "We don’t talk about timelines. The President’s made a commitment. We’re going to withdraw our uniformed personnel, uniformed guys, 2,000 roughly folks on the ground," Pompeo said en route to Ireland, according to a statement. "We’re going to withdraw them from Syria," he said.Asked whether he will talk about timelines with the allies since they have several questions about the U.S. withdrawal strategy, Pompeo said: "I’ve actually spoken to them all. "He added the U.S. will continue to stay in contact with the allies, saying: "If it’s not going perfectly, we’ll work to make it better. We’ll make sure we address concerns that they have. "When Pompeo was asked if President Donald Trump and National Security Adviser John Bolton had contradictory remarks over Syria, he said: "I think they’ve both said the same thing. They’ve both said we’re going to get out. ""The President said we’re going to do it in an orderly fashion that achieves our objective, and that the -- our mission set in the region remains unchanged. Those seems pretty -- it seemed pretty consistent to me.Pompeo did not give information whether the withdrawal started already and the diplomatic personnel left Syria.In December, Trump announced plans to withdraw roughly 2,000 U.S. troops from Syria, claiming that American forces had defeated Daesh there. Turkey has been the "only friend" of Kurdish people, the spokesman for the ruling Justice and Development (AK) Party said on Tuesday. "No one can teach the Republic of Turkey lessons about protecting our Kurdish brothers. The Republic of Turkey is the biggest, even the only friend of the Kurds," Omer Celik told reporters in the capital Ankara.Celik added that Turkey is also a friend to Arabs and Turkmens in the region. "Those who tell Turkey 'don't touch Kurds' should look in the mirror and remember their oppression of Kurds," he said, evidently referring to remarks by U.S. Secretary of State Mike Pompeo and National Security Adviser John Bolton warning against Turkey attacking "Kurds," in an illicit conflation of “Kurds” with the terrorist PKK/PYD.Turkey has said it is planning a counter-terrorist operation into Syria targeting the PKK/PYD, following two successful operations since 2016.Ankara has criticized the U.S. working with the terrorist PKK/PYD to fight Daesh, saying using one terror group to fight another makes no sense.In its 30-year terrorist campaign, the PKK has taken some 40,000 lives, including women and children. The PKK/PYD/YPG, its Syrian branch, terrorizes Kurds, Turkmen, and Arabs in Syria, according to Turkish officials.The U.S. should know that Turkey is its ally, said Celik, calling it allying itself with terrorist groups a “great failure.”He added that Pompeo and Bolton "explicitly" know that the PKK/PYD is a terrorist group.- Local electionsCelik said Turkish President Recep Tayyip Erdogan will announce on Jan. 31 all mayoral candidates for the upcoming local elections. "We will hold the introductory meeting [of all mayoral candidates], where we announce manifesto on Jan. 31 in Ankara," Celik said.The local elections in Turkey are scheduled on March 31.